VATICAN CITY (CNS) — When the head of the Pontifical Council for Culture said he wanted to listen to what today’s young people had to say, he wasn’t afraid to hear it belted out at 100 decibels. 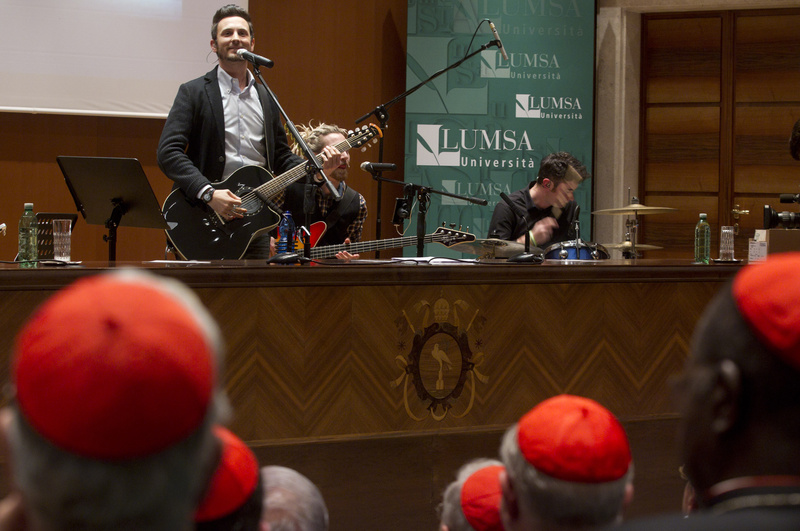 It was the first time a Vatican dicastery had a rock group as the “opening act” of its plenary assembly — usually a routine, speech-filled, sit-down affair where members come together a few days days to discuss a relevant theme. 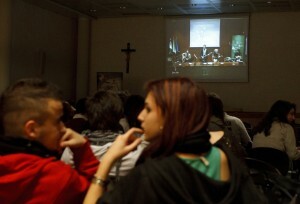 But if the culture council was going to discuss “Emerging Youth Cultures” for their plenary at the Vatican Feb. 6-9, then what better way to get a feel for the subject than by inviting young people in, the cardinal said. “The church has lots of beautiful things to say” about things young people care about, “but it needs to find a way to say it,” said Francesco Lorenzi, singer for the Italian punk band The Sun. “We adults, older generations, and we priests have to make an effort to not put (young people) under a sort of microscope, but go to their level and begin to listen a little to what the rhythm of their mind, their heart is like,” Cardinal Ravasi told Vatican Radio. While Vatican VIPs weren’t dancing in the aisles, many read through the lyrics and applauded with smiles. In between songs, Lorenzi explained the band’s evolution from its birth in 1997 as Sun Eats Hours, which is an Italian saying equivalent to “time is fleeting, so get as much out of life as possible,” to being voted the “best Italian punk band in the world” in 2004. “I saw a joy I never saw before and at a place I thought was for nerds. But it was the kind of joy I needed more than ever,” he said. Bolstered by a new community, prayer, Mass and eucharistic adoration, Lorenzi’s life changed completely, he said. The other band members saw the transformation and slowly — over a period of five years — followed suit, wanting to discover the source of Lorenzi’s contagious happiness. The band members had a new mission in life and on stage, Lorenzi said; they cut the band name down to The Sun “because it shines forever” and focused the lyrics on “what matters most in life,” like love, friendship, “life after life” and faith in God. He told Catholic News Service that people don’t need to “hit bottom” before they discover the beauty of salvation. “Jesus will come and get you, trying up until the very end, but that doesn’t mean you have to hit bottom, because he’ll take you even when you’re doing fine,” he said. Asked “what helps attract young people to the church?” the responses included, “credible and enthusiastic witnesses,” but also pilgrimages to the Holy Land, a chance to have a personal spiritual guide and outlets for artistic expression, the booklet said. “What do you want from the church?” evoked responses like greater trust in laypeople, putting the great questions of life front and center, and clear, sincere honest dialogue where formality and abstract ideas get set aside now and then, it said. “What keeps the church and young people apart?” elicited replies like not understanding the reasons behind positions the church takes, “ostentatious wealth,” a lack of answers to people’s questions and poor communication skills. “The church has lots of beautiful things to say” about things young people care about, “but it needs to find a way to say it” and have that message reach young men and women everywhere, Lorenzi said. But even the most stirring speech or web post can’t answer people’s hunger for human contact and understanding, Lorenzi told CNS.